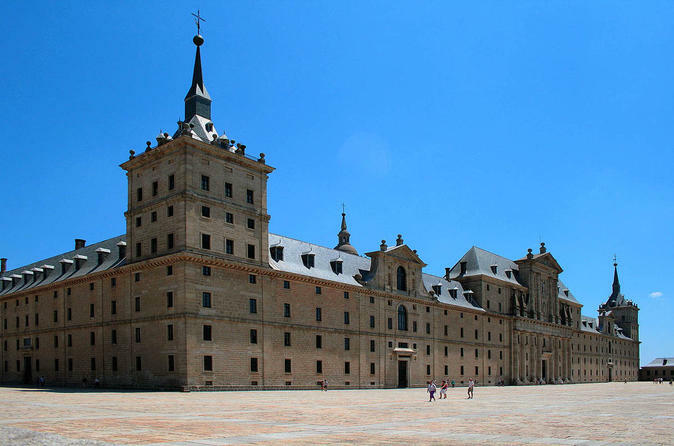 Book this tour and in less than six hours you will visit El Escorial Monastery and The Valley of the Fallen, two of the most known and impressive monuments in the province of Madrid. You will have the option to upgrade this experience by enjoying a tour of the capital's city centre or a tour of Toledo with an optional lunch. Hop on a coach and start your journey to San Lorenzo del Escorial municipality, in the province of Madrid, where both monuments are located: El Escorial Monastery and The Valley of the Fallen. The first stop will be the Monastery which was built in the sixteenth century under the reign of the powerful king Felipe II and conceived as a royal residence, a monastery, and a pantheon for the royal family. It became a symbol of the greatness of the Spanish Empire, and has been declared a Historical Heritage Monument. You will be visiting the following areas: the monastery, the Royal Palace, the Royal Pantheon, the Basilica, the Cloister of the Four Evangelists and the Chapter Houses. From there you will get back on the coach again and head towards The Valley of the Fallen erected in the beautiful Cuelgamuros Valley in the Guadarrama Sierra. It is an impressive monument erected in memory of those who died during the Spanish Civil War of 1936. This colossal work consists of the basilica and the crypt excavated in the rock of the mountain crowned by an impressive cross of over 150 meters. Once you have visited the interior of the landmark, make your way back to the departure point in Madrid. Upgrade your experience and after the morning tour in San Lorenzo del Escorial, make your way to the city of Toledo 70 Km. south of Madrid. Stroll through its streets with your guide and discover the rich history and culture behind its walls. Choose this tour including a local lunch and have the opportunity to try some traditonal dishes, such as garlic soup. Upgrade your trip and after the morning tour, make your way back to Madrid where you will walk around the city centre with your guide. Discover the main landmarks and all local hotspots.